This emblem of the unified core curriculum of the College of Arts & Sciences was created by Virginia Green, associate professor of art at Baylor University. It reflects the A&S Core Curriculum Vision requirement that the core provide shared knowledge, develop essential skills, and inspire virtues to undergraduates. Shared Knowledge. 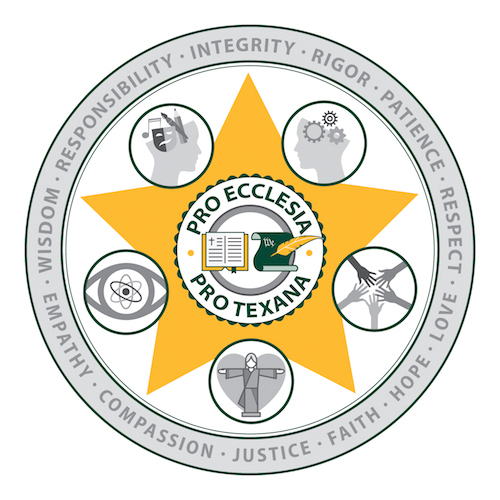 The center of the logo with the Baylor motto in the lone star suggests the core’s relevance to the historic mission of the University. The Bible represents the religious knowledge attained in the three common courses — Christian Scriptures, Christian Heritage, and Chapel — that are devoted to equipping students for service in faith communities. The U.S. Constitution represents the civic knowledge attained in the four common courses — The U. S. Constitution, Its Interpretation and the American Political Experience; The United States in Global Perspective; American Literary Cultures; and the Civic Engagement Seminar — designed to equip students for leadership in a democratic society. Essential Skills. The five inner circles with the images of head, hands, heart, body, and eye represent the skills that are engendered and honed in courses in the sciences, humanities, fine arts, and social sciences. Specifically, these circles represent the Vision’s attention to Critical Thinking, Creative Thinking, Civic Engagement, Christian Understanding, and Scientific Reasoning. Virtues. The outer circle lists moral, intellectual and spiritual virtues specified by the A&S Core Curriculum Vision: responsibility, integrity, rigor, patience, respect, faith, hope, love, justice, compassion, empathy and wisdom.